Skank Skates has been open since November of 1988. 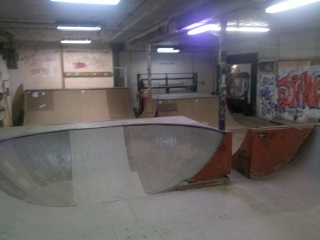 The indoor mini-ramp complex is located at 1101 South Grand Avenue East in Springfield, Illinois. Please call (217) 522-RAMP to make sure the ramp is open before coming down. During the week, the ramp is open most weekday evenings. On the weekends, the ramp is open afternoons and evenings.